Roleplayers Chronicle touches base with Eloy Lasanta of Third Eye Games as part of his AMP: Year One promotional week. This interview wraps-up our three part series consisting of a review, designer’s diary, and interview all regarding the first book of the new AMP series, powered by DGS-Combo. Today, Editor-in-Chief Aaron T. Huss, depicted by the prefix RPC, is talking directly with Eloy Lasanta, depicted by the prefix EL. The interview took place over Skype messenger. [RPC] Welcome everyone to another Word in Edgewise with Roleplayers Chronicle. Today we’re talking to the brains behind Third Eye Games: Eloy Lasanta. Eloy, can you please start by introducing yourself, talking a bit about your publishing and roleplaying history. [EL] I’m Eloy Lasanta, owner/operator/samurai of Third Eye Games! We started in 2008 and have continued to produce quality RPGs since, including Apocalypse Prevention, Inc., Part-Time Gods and Camp Myth: The RPG just to name a few. Been nominated for two ENnies Awards, but just haven’t been abel to grasp the gold ring (maybe next time) and I’m also passionate about pushing the industry into new heights of creativity and storytelling. As for my Roleplaying history, I’ve been doing this for quite some time, over 20 years (even though that’s a drop in the bucket to some gamers I’ve played with). I began with Rifts and graduated to White Wolf and then bounced around to as many systems as I could learn ever since. I think of myself as an RPG rouge scholar, wandering the earth looking for that next game to play. [RPC] What made you decide to become a writer and indie publisher? [EL] I had always been writing for free, be it fan stuff for my own web sites or for fan magazines. I wanted the taste of writing something official, so I put some submissions in for various companies and a few bit. One in particular, Vajra Enterprises. The head guy over there, Brian St. claire-King, took me under his wing and we co-authored a brand new RPG from beginning to end. That was where I really learned how to craft a game and what a book needs to be useable and fun. Striking it out on my own was honestly just the next logical step. To have all this knowledge and not use it would have been foolish. Some people say “Knowledge is power”, but I’ve always believed that “Knowledge + Action is power.” If you don’t use that knowledge, then it’s meaningless. [RPC] What was the brand new RPG that you co-authored? [EL] Well, it’s hardly brand-new anymore, but the game was called KidWorld. It was a post-apocalyptic setting where all the adults were dead where everyone played kids fighting for survival. I think the problem it had with selling big was that people don’t like to play games where kids are put into dangerous and icky situations. I dug the hell out of what we came up with for that game though and it hold a special place in my heart to this day. It’s still available on DTRPG and whatnot. Pick it up if you have $5. I’d love to hear anyone’s thoughts/opinions on it. [EL] The Dynamic Gaming System (DGS) was the clever name I came up for the house system for Third Eye Games. It uses a single d20 for all checks, but differs greatly from the D20 system. The biggest thing it does is gives players a lot of choice character creation and makes decisions matter when you get into combat. To date, there have been a few versions of the DGS. Apocalypse Prevention, Inc. and Wu Xing: The Ninja Crusade both used the DGS, while Part-Time Gods used the DGS-Lite. 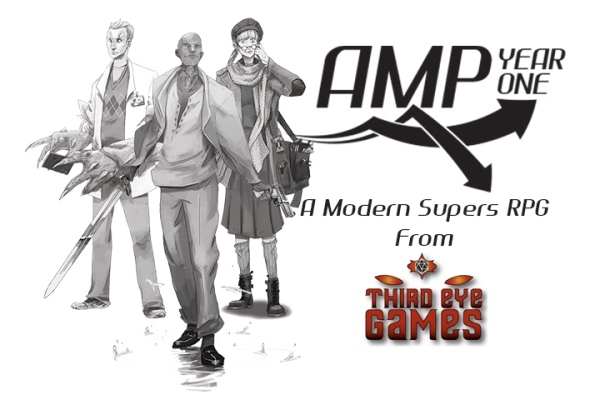 AMP: Year One, my new game, uses a new version of it called the DGS-Combo, and we are currently developing DGS 2.0 for Apocalypse Prevention, Inc. 2nd Edition. If you know one, you can play them all though. [RPC] What’s different about DGS-Combo compared to the base Dynamic Gaming System? [EL] The major difference between the two is that the DGS-Combo drops the Attribute + Skill setup and moves to a Skill + Skill combo system. It works really well with the powers as presented in AMP: Year One and allows for a lot of freeform use of powers beyond what can be done if one was limited to Attributes. An example roll would be fixing a computer. This would be a Crafts (for fixing) + Technology (for computers) + 1d20 and that’s it. It allows for players to get creative with their skill application as well, which is always fun. [RPC] Tell me a bit about the AMP setting and how the Year One book fits into the overall setting’s publishing scheme. [EL] AMP: Year One takes a microscope to the first year of what happens when people start to develop powers. This means looking at some of the people who are affected and examining how it affects them, as well looking at society at large and thinking about how people as a whole would react. The book follows certain characters along their personal journeys and uses a backdrop of societal snapshots to show you how their presence is changing the world around them even without them trying. As far as the future of the game line, the idea for a progressing story was always the plan. We have the story planned out through AMP: Year Five and who knows if it will continue from there. It allows us to break down what it means to the world that supers exist and not just “supers came about and now they’re here, now go play.” In AMP: Year One, players are taking part in the shaping of how the world will perceive their powers and their place in society. [RPC] What did you do different with powers that required the change to the DGS system? [EL] What is different about AMP: Year One is that powers work very differently from what other supers games have given us for decades. Most are toolkits to pick and choose whatever power you want, but AMP: Year One took a much different approach. In a game where a character only has up to 3 powers and the vast majority of them really only have 1 or 2, each power needed to be something special. This made each individual power quite unique, though some of them also overlap with others. For instance, if you take the Chimera power (gaining animal features), you can eventually gain claws by taking the affinity of a cat or something. There is also the Claws power that takes this concept into its own power, but you don’t have to take Claws in order to have claws. If you have the power of Wind, you can make yourself fly with it. You don’t HAVE to take Flight, which is it’s own power. It allows for a lot of customization within a power theme, instead of everything being a grab bag, mechanically. Well, powers always work differently for every game line that I’ve created. They need to fit the game world being portrayed instead of having one way powers work for each. So these have always been changed within the DGS to make fit the game itself. ‎Powers are additionally fueled by Juice, which is a whole other new aspect to how powers work. Since powers are linked to adrenaline, I wanted to have a give and take feel. If danger pops up, you get more Juice, because your scared and your adrenaline pumps more and more. If you see a friend get mortally wounded, you get juice, if you take a bunch of damage, you get juice. All of these things are connected and have a sway in how much you’ll be able to use your powers. If you’re just sitting around watching TV, your adrenaline has very little effect and so you can basally just use simple powers. [RPC] Tell me more about the mechanics surrounding Juice and adrenaline. [EL] Mechanically, all players have 3 Juice at a resting state. This means they can use their powers a few times, before needing to wait for them to recharge essentially. If some ambushed them, for example, everyone would get 1 Juice from the surprise, so then they’d be at 4. If during that surprise, someone close to them was injured, this might make them mad, thus giving them another Juice and pumping them up to 5. Juice is represented by beads, poker chips or other trackers and make it a very tangible thing of how much power you currently hold. What this system also does is stop characters from being able to hoard Juice, because you’ll start to lose all this extra Juice you’ve gained if you get into a state of rest. [RPC] How many Juice points does it cost to use a super power? [EL] Typically 1 or 2 for standard powers, all the way up to 4 for the big ones. [RPC] How much can a character accomplish when using a super power? Does it last a single round or action? Or is this something that is activated and lasts for an entire encounter? [EL] Depends on the power they have. Some powers, like Intangibility, may last for the Scene. Others like Behemoth are always active. And still others, like Bolt, are an instant effect. Each power actually works within it’s own microcosm, so they aren’t just copies of each other in their makeup. Some really do just happen and then they are gone, but usually with great effect. Some are a lower-level constant effect instead. [RPC] How are powers weighted in regards to character advancement? Are there low level powers along with mid and high level? Do the various powers scale as the character advances? [EL] All powers are equal in how they are selected for the character and every AMP can have up to 3 powers: Primary up to Level 10, Secondary up to Level 7 and Tertiary up to Level 4. This also creates yet another choice that players much make for which powers are most important to their character concept, knowing that some powers will have a level cap. However, selecting Telepathy or Behemoth is simply a matter of taste. One is not a lesser power than the other. As a character advances, players receive XP to spend on whatever they want (Skills, Powers, Gifts, Loyalties, etc. ), so they get to choose how they want to progress. [RPC] You stated that their primary power can be chosen up to Level 10. What do those levels mean? [EL] The higher the level, the more proficiency the character has with that power. So, a character with the Primary power of Invulnerability means that the player has made the conscious choice to have their focus be on that power. No other power will be better than that power, because THIS one is their primary. Even if someone else had Invulnerability as their secondary, their potential for mastering that power is far below yours. It makes it a very important decision for what is the characters’s Primary power. Secondary and Tertiary powers are there to add more flavor and options, but the Primary power is where it’s at. [RPC] Does the level of a power add to the dice roll, or does it measure how strong its effects are? ‎And again, it depends on the power. Some give bonuses to Skill checks, while others increase the range the power can be used. For every two levels, as well, the character receives an Augment (either enhancing an existing ability or giving a new trick to use your power for), which further boosts the usability and options for a power. [RPC] Are powers tied to a single skill or is each one tied to a different skill depending on what its effects are? [EL] Powers affect skills that make sense for their use. Behemoth obviously affects the Might skill, Acceleration affects the Speed skill, Invisibility affects the Stealth skill and Pheromones affects the Persuasion skill. Some affect multiple skills and others have a different effect than boosting skills. With each power being it’s whole own thing, there isn’t a rule that simply applies to them all. [RPC] How many powers are there to choose from? [EL] There are 54 total powers, ranging from energy constructs to super speed to shapeshifting and teleportation. There is a reason why it took 6 months to get the powers section done and written. There is SO much to the balance and usability of each power that came out very elegant in the final product. [RPC] I’m assuming you spent that time distinguishing one power from another so that they are truly unique in their application while still being balanced…? [EL] Exactly! I needed to ensure that if someone selected Psychometry instead of Invulnerability that they felt they were getting the fair end of the stick. There are times in other supers games where someone picks a power (like Immortality) that basically has very little effect on the game. But, like, they spent points on that, they need to get their “money’s worth” as it were. Immortality is actually a power coming AMP: Year Two and I spent about a week to really conceptualize it and make it a unique power that someone would be proud to call their Primary power. That’s really the thing. Every power would be an amazing Primary power to have. [RPC] How long did you playtest the list of powers? [EL] Playtesting went on for about two or three months, where a lot of holes were poked and filled and poked and filled and poked and filled. A lot of crazy, game breaking combos that needed to get hashed out and balanced. We had an amazing playtest session with AMP: Year One, 3 groups who gave VERY detailed reports back of all their multiple sessions. [RPC] That’s quite a feat! Let’s shift a bit to the future of AMP. You had stated that you plan to continue the living storyline through Year Five. What does each “Year” book add to the system and setting? [EL] To the setting, each book with advance the storyline by (wait for it) one year. Within each of these books, we’ll see the characters we met in Year One grow (not all of them make it to the end, mind you) and we get to see how society begins to evolve as people with powers exist. From a mechanics standpoint, we are progressing powers very logically. Each year should have at least 9 new core powers along with some other additional thing that people might not be expecting. For AMP: Year Two, for instance, we have 9 new powers and then Gadgeteering. This isn’t some strange, out of the blue move though. It make sense within the setting and the story we’re trying to tell, which is why it’s popping up now. We want all of our books to have a very logical growth to them, instead of just trying to cramp as much into a book as we can. [RPC] So you’re saying that the mechanical offerings in each subsequent book is tied to the living storyline? [EL] Most of them, yeah. There are new Affiliations (factions that characters can be a members of), new Gifts and Drawbacks, that make sense within the setting, and yeah, the plan is for everything to be as cohesive with the AMP storyline as possible. ‎Any new powers we come up with are being used in the storyline. Like, we’re not just throwing Immortality out there by accident. We have a character in the story who will be using it as part of the story. [RPC] Do you have any other supplements planned in the upcoming years? [EL] We currently have Adventure books planned for each year. Basically a collection of events that happen within each timeline that the players and their AMPs can personally take a hand in. For AMP: Year One, we have one adventure ready to be release very soon, with about 4 or 5 others on the way to completion. It’s a fun project that I think will enhance everyone’s enjoyment of the game as each year goes by. The idea is to play in the world, after all. [RPC] Is there anything else you’d like to add before we wrap this up? [EL] I just want to say that I’m very happy with not only how AMP: Year One turned out, but also how everyone has really embraced it as a game they want to play and share with others. We will continue to make this amazing line even better, and we hope you’ll come along for the ride. [RPC] Thanks Eloy for taking some time out to talk about AMP: Year One! [EL] Thank you for having me!